These aren't for sale...I wanted to put a picture up for you to take a look at and give some feedback. Positive or negative, please comment. These aren't for sale, I just want to know what you think--good or bad--and why. Any feedback's appreciated. Both are crosscut with a border stamp. Hermann Oak premium leather--tanned in the USA--dual-layer/doubled and stitched with solid brass buckles and Chicago screws. Both 1 1/2" in width, and 1/4" thick. The top one is black cherry, and the bottom is black. I like them! nice tooling work, never a bad thing to have a spare gun belt or 2 around. Very nice. The stamping adds an upscale look. I like the dual loops on the black one. Now thats just my taste, but your craftsmanship look excellent. 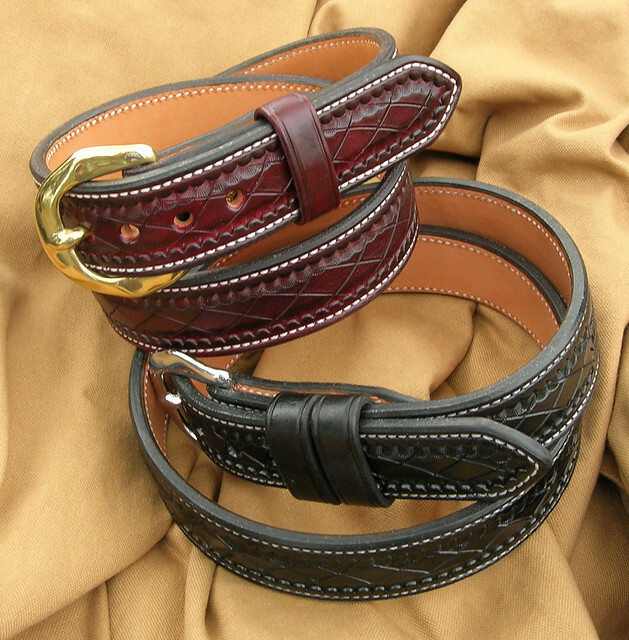 Stamping is very nice, Good looking leather nice colors, edging....Very nice work! I have to agree about the buckle. But otherwise they look great! I like the buckle and the rest as well. Thank you, everybody. They are a little "different." Will Tucker at www.TuckerGunleather.com, does something similar. Some folks like 'em, and others are in the "no, I don't think so" camp. We all do plain, black with black stitching, etc. You've all probably seen more than your share of those. Thought I'd toss these up and see what the feedback was--which I really appreciate. Good or not so much. Thank you, Matt. You made my day, sir. I think you did a darn good job. I like both of them. "Never complain about growing old, far too many people have been denied that privilege". I like 'em too...very nice work! So WILL these be for sale in the near future or was this just a cruel "tease"? I'm going to need a new belt soon and would certainly consider purchasing one similar to these when the time comes! as one who has the dreaded Dunlaps disease, (my belly done laps over my belt,) I have become a big fan of tapered ends belts using a smaller buckle that shows less when wearing Dockers, etc, and yet still fills the slots on my holsters. any chance of you making some of those?